On Thursday, August 2 local musician Marc McNulty will be performing live on Rare Frequency. 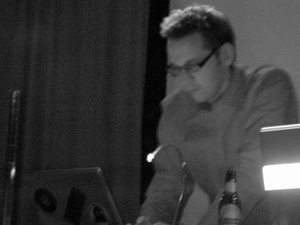 Marc has been creating electronic music and sound art since 1989. Inspired by everything from mid-century musique concrète to eighties industrial music, Marc mixes organic and synthetic elements using self-designed software tools and a variety of analog and digital sound sources. This will be Marc’s second appearance on RF. 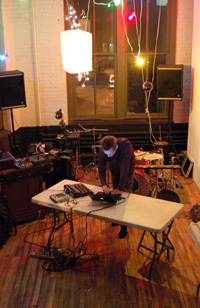 You can hear a podcast of his first performance here: Rare Frequency Podcast Special Ed. 9: Marc McNulty Live 10.26.06 In the week prior to the performance, Marc was kind enough to answer some questions by email. Could you tell me a bit about your background and how you became interested in making music? I’ve always been fascinated with sound. I was surrounded by shortwave radios when I was very young; these sounds of the ‘outside’ world and the ‘other’ world of atmospheric events became a vocabulary that I understood at times better than a spoken language. The odd science or methods of discovering these and other sounds formed a deep part of my psyche. When I first heard Musique Concrète and Acousmatique works I knew there was something more to my toying with electrostatic sounds. About making music, I cannot say it better than Edgard Varése: “Music is organized sound”. What kind of tools (instruments, etc) do you use when composing? I use a collection of recorders, primarily small digital recorders with some DIY microphones with odd shapes or extra resonators on them to make the captured sounds effected. I don’t always do this, I mainly collect sounds as cleanly as possible and work with them in a software editor with some effect (plugins) that I developed in MAX/MSP and some other tools. When I am composing, if it can be called that, I am listening for patterns and focus on them intently. When I am laying out a work I use Ableton Live because it is very visual and suits my methods, plus performing with it allows so many realtime options. I do use some synths, like a Waldorf Microwave XT, analog filters, and Reaktor to build complex sounds and interactions. Your last three releases on Earphone have been quite varied. Is there a common thread that you see running through them? I see the common thread as me exploring. I know that many times an artist is expected to have a specific ‘sound’; I think I do too, it is just more hidden in the small details. My works are made at a specific time and can only document my thoughts and reactions to the source material I am using. I think the sounds tell a far better story than I can. Maybe they are a ‘cinema for the ear’?Are there any artists, musicians, etc. who have especially influenced your work? I won’t bore you with a long list, but right now the works of: Asmus Tietchens, Paul Virilio, Pierre Henry, Andrew Liles, Bronwyn, COH, Olaf Bender, Praveer Baijal, Hans Peter Kuhn, and Sigtryggur Berg Sigmarsson. But, I could rattle on…. What projects — records, live sets, etc. — are you currently working on? I am working on a worldwide sound streaming project at www.locusonus.org, plus a project with Marcin Barski of Audiotong in Krakow,Poland. Plus, at the end of August I am doing some sound works in Copenhagen, Hamburg, and Berlin, plus a few places along the rail lines. There is always something to listen to at www.earphone.org.